Welcome to the home page of the Ron Peberdy Cyberknife Trust, the aim of which is to promote awareness of a specialised piece of equipment called CyberKnife. The CyberKnife® Robotic Radio surgery System is a non-invasive alternative to surgery for the treatment of both cancerous and non-cancerous tumours anywhere in the body, including the prostate, lung, brain, spine, liver, pancreas, heart and kidney. The treatment – which delivers beams of high dose radiation to tumours with extreme accuracy – offers new hope to patients worldwide. This technology has been available throughout the world for about twelve years and in the pages and links you will find on this site, there will be many stories and examples of patients who have benefited from this treatment. Unfortunately, Cyberknife treatment has not been available in the UK until very recently, and then only to paying clients in Harley Street. Our mission is to make this treatment available through the NHS to everyone who will benefit from it. 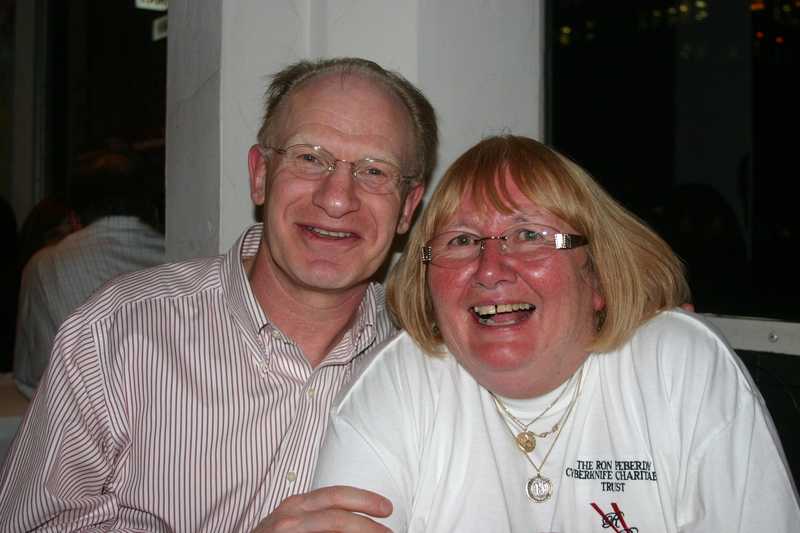 When Ruth’s husband and our friend Ron died of pancreatic cancer we were so impressed with the treatment and the hope that it gave to those suffering from previously inoperable cancerous tumours we decided to question why this treatment was not available in this country. Unfortunately treatment with Cyberknife came quite late on in Ron’s illness and whilst it gave him an extended quality of active life it did not offer a complete cure. Our aim is to try to ensure that others receive a better chance than he did. Like many things in life most solutions lie in the availability of funds to help solve the problem. Fortunately, the NHS is gradually taking note and plans are in the offing to open a CyberKnife centre in the NHS. However, this is not enough!! We need many centres throughout the country or the waiting list which will arise will mean that only the lucky few will receive treatment. If you feel able to make a donation to our cause there are links and contact details on this site. All funding received will go towards providing information and hopefully our own CyberKnife Centre in the South West.